Just as Half Life had its head crabs, Alien Nine, a bizarre attempt to fuse the school slice-of-life genre with bloody alien hunting antics, has the ‘Borg. I suspect the name is no accident. There seems to be a trend today to telling stories in media res, in the middle of things–dropping us into an unfamiliar world with little direct explanation. Alien Nine lands the reader into a world where aliens are commonplace: creatures of all varieties, mainly inspired by the designs of amphibians and other marine animals. And into this zoological cornucopia goes the Alien Party, a committee of sixth grade girls (yes, eleven and twelve year old girls) who are charged with the task of hunting them down with the help of their ‘Borgs: the frog-like species who live on the sweat of their naked backs and who form a symbiotic relationship with their wearers. They also talk, sometimes sarcastically. On the surface, this seems like the setup for an innocuous, even childish story full of whimsical adventures, non-threatening creatures, and cute antics. Hitoshi Tomizawa, however, is up to something else. The aliens are not drawn in a cute manner for one. They are slimy. They explode into bits and pieces of goo when destroyed. The protagonist of this story, an unwilling girl named Yuri who loathes the job and can be found crying in nearly every scene in terror and sadness, makes her distaste plain. As moritheil noted in a review of the anime OVA, this trait of hers gets irritating quickly. She is balanced by her colleagues in the Alien Party, Kasumi and Kumi, who don’t share her sentiments and seem rather eager to take on their roles. This, I think, helps prevent the story from becoming too one-dimensional. One volume of a manga is not, actually, all that long–but so far, there is little explanation besides dates for when, how, and why there are so many aliens and alien landings on earth. Or why sixth grade girls are chosen as the herders of various errant species, and why one particular species (the head frog Borg) have decided to be of use. It is not a pleasant job in the least, with the risk of death to both Borg and human, and the results are distinctly messy. Yuri’s problem is that her fear overcomes her ability to control the Borg on her head and the results are somewhat reminiscent of Chise’s problems in Saikano. So far though, Yuri is not as sympathetic as the characters in Saikano and the degree of “normalcy” that the scenario is being accorded within the story is somewhat puzzling. It is a story filled with extremes but done in a cutesy, rounded art style and the pacing of a slice-of-life. As far as I can tell there are only three volumes in this manga, and since it’s out of print (it was published by the defunct Central Park Media), it’s only available used for very cheap. 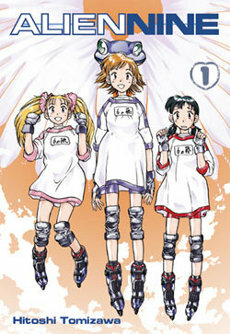 I’ll pick up the other two volumes to see how this ends; I am told more shocks await, and are different from the anime. (Which I have not seen.) However, that won’t be this week. Stay tuned for more reviews coming up on this manga review week at Anime Diet! Previous PostWelcome to the NHK! Vols. 5 & 6–Lying To YourselfNext PostTsundere Banana – that Guy Had a Friggin’ Private Small Plane! I actually own the Manga & the anime myself, and is one of my favorite short series in my collection. Pretty gruesome & unforgetable, though it can be a bit confusing at times. I hope you enjoy it. The anime is actually pretty close to the manga storyline-wise, it just expands the themes more, like adding Yuri’s dreams to flesh out her distresses. Between the two versions, I like the anime better; it polishes the rough ideas of the manga and subtly elevates the whole experience. However, it stops only halfway through the storyline, so you have to read the manga to finish it.